Need a move approved? We've got the ... glaives you crave? Just post your damn moves. When writing more unusual moves, try to be as descriptive as possible. How is the move performed? What does it look like? How does it feel to get hit with it? This helps a lot when you're roleplaying someone else's character and moves. See the following checklist from the Moves Rules for ideas of what you'll need to include in the description. Quote: -How powerful is it? Does it have a wide area of effect, or multiple projectiles? How big is the weapon? What size are the projectiles? -Is it instantaneous, or quick to use? Or is it slow? -Is it difficult to aim? Must it be aimed at all? -Does it have effects that linger after the user is no longer performing the move? If so, how long do they last? -Can the user move around or do other things at full effectiveness while using the move? Must they be stationary? -Does the user have to maintain their focus, or is it ‘fire and forget’? -What does it look like? How is it performed? How does it feel to get hit with it? Is it melee-based? If so, you'll need the Physical Strength proficiency. Does it continue to deal additional damage after it has been used? If yes, you'll need the Damage-Over-Time proficiency. Is the target area big enough to hit more than one target? Can it miss and still do damage from 'splash' damage? Is it a shield which covers an entire person? If yes to any of these questions, you'll need the Wide Proficiency. Can it be manually controlled by the user at range, like an elemental kinesis? If yes, you'll need the Remote-Control Proficiency. It is a projectile which locks-onto the target, or an attack which simply appears on the target like magical bindings? If yes, you'll need the Lock-On Proficiency. Can it impair the target's movement, attacking or defensive capabilities, mental faculties, vision, hearing or anything else in that vein? If yes, you'll need the Debilitate Proficiency. Dual Kukri (300): Traditional utility knives, both about twenty inches, with inwardly curved blades designed to turn away enemy weapons and deal shallow, agile attacks. Cyclonic Prison (300): Whirda strikes the target with her kukris, summoning a cyclone of buffeting winds around them, preventing them from moving for a few seconds. This move does no damage and is primarily used to facilitate positioning or escape. Requires disable proficiency. Gust (300): Whirda strikes the target with a kukri, summoning a gust of wind. If used on an ally, the gust can propel them quickly forward or knock them to safety. If used on an enemy, the gust can knock them in target direction if they are light, or hold them back momentarily if they are heavy. Requires disable proficiency. Both air moves require disable proficiency and deal no inherent damage. I'm not sure if I'd need to pay OM for both blades separately - they're quite small and defensive. I designed a set of moves based on, you guessed it, the Mega Man 3 Robot Masters because a.) I wanted to and b.) I felt it would be a nice exercise in creating/writing moves. DLWN Series - As part of Wily's combat upgrades, Proto Man was able to download data on the other Robot Masters and replicate the effects of their moves, much like his 'brother' Mega Man. Given Proto Man's unique CPU, he quickly developed a way to edit the coding to suit his purposes. When he uses these moves, the color of his armor and body suit change, which is reflected in each moves title. Unless otherwise stated, the strength of each attack is comparable to an uncharged burst for the Proto Buster. Divine Buster moves! All moves have the capacity to work with the cartridge system, once it has been restored to Raising Heart, and will be updated later (probably at a higher cost) to reflect this. This is the extended range version of Divine Buster, with ranged increased to approximately 1-5 kilometres. Base charge time is increased to 12 seconds, with an additional second for every 500 additional metres fired. Otherwise, the spell is identical to regular Divine Busters, but with additional mana needed for the added range. This is the Area Bombardment-type version of Divine Buster, transforming the spell effect from a single cylindrical beam into a wide-area cone-shaped blast. This version of the spell has a cast time of 15 seconds The range, effectiveness and accuracy of the spell are identical to the regular Divine Buster, except the blast now encompasses an area over two hundred metres in diameter. The beam's damage is indiscriminate and explosive, and will damage anything within the blast that is unable to protect itself. This version of the spell requires significantly more mana than the straight beam versions. 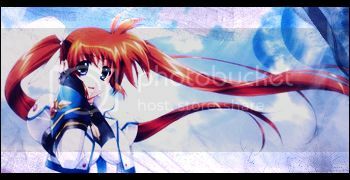 Nanoha Takamachi Wrote: Due to the recent changes, and the alterations I am having to do to my roster, I need some moves and move changes priced and approved. One of Nanoha's two signature offensive moves, Divine Buster is a Bombardment-type spell, designed for medium to long range attacks. Originally designed as an energy beam used to seal Lost Logia, Nanoha later developed the spell into a powerful beam attack. As such, it is one of her only advanced offensive spells available in Sealing Mode, one of Raising Heart's forms that has been deemed redundant and thus rarely used, in addition to all advanced Device Modes. The spell itself can only be cast while stationary and requires manual aiming up until the beam is released. The spell requires approximately 10 seconds of charge time, has an effective range of 200 metres , a beam diameter of three feet and fires a straight beam unaffected by gravitational forces that will affect all targets within the radius of the beam. The destructive power of Divine Buster is incredible, but only direct hits will deal full damage. Direct hits result in an explosive magical effect of about five metres, that will cause destruction to nearby structures, equipment, and other creatures caught in the blast, though at significantly less strength than the beam itself. Divine Buster has a firing time of approximately three seconds, and at maximum range the beam will disperse fully after five seconds. During that time, Divine Buster is capable of breaking through shields, barriers and the like, but the destructive power of the beam will be dramatically reduced. The spell itself is moderately draining, but requires all of Nanoha and Raising Heart's concentration to cast, although existing spells that do not require their attention will persist. When cast in Buster Mode (or higher) the diameter of the beam is increased to roughly 6 feet wide, and the destructive power of the spell is significantly higher. (300 OM, Require Wide Proficiency) ? 600 OM due to the two forms of the attack. Protection is a basic barrier-type defensive spell, generating a spherical magical barrier around the user to ward off enemy spells and attacks. It is inherently stronger against magical attacks than physical ones. Protection has a wide area of effect (a sphere around the caster) and a very quick cast time, but lacks the defensive power of more advanced defensive spells. An attack with power stronger than a Protection spell will shatter the barrier and continue, though with less momentum or energy. Nanoha has a natural affinity for Protection, and appears to generate spells capable of more defensive power than most other users. (300 OM, Requires Wide Proficiency) ? Nanoha's most basic offensive spells, Shoot Barret forms a small sphere of explosive mana and accelerates it forward in a straight line. The speed of the bullet is quite fast, but the damage output of the bullet is low. Nanoha is capable of firing Shoot Barret rapidly, though it will eventually become quite draining to do so, and requires precision and concentration to be effective covering fire, in addition to being of relatively low offensive power. Identical to Shoot Barret, except each sphere is now coated with an additional layer of mana. The spheres have a slight increase in offensive power, but the main purpose of the additional layer is to allow it to pierce barriers and anti-magic fields. The outer layer of explosive mana reacts upon contact with a barrier or AMF and detonates, allowing the inner sphere to penetrate the defences. This is only a time-consuming process when firing a rapid barrage of Shoot Barret attacks, and will noticeably slow down the speed of recast. Just posting these for posterity. A beam that summons large, heavy cubes roughly five feet in diameter. Block Beam was designed as a tactical upgrade to allow Aran to create her own cover during a firefight, as well as a physical obstacle to an opponent attempting to close a distance. It takes just over six seconds to create a block and a small portion of power from Samus’s suit. Samus can create a block in any location in her line of sight within thirty metres, which she does by pointing to the target location and maintaining the beam until the block has fully materialised, at which point it drops to the ground. The beam itself is green and emits a distinctive hum while it materialises the block. The blocks are too heavy to be thrown, but can be fairly easily pushed by Samus due to her augmented strength. A minor detail is that the outward colour and texture of the blocks can be changed. A persistent beam of energy roughly one meter in length. It is a quick to activate, toggle-able setting on Samus’s arm cannon. In many ways it is closer to a chainsaw than it is a sword, as the beam’s energy will ‘buzz’ upon contact with a target, though it cannot cut through most other weapons excepting those not designed for melee combat. It takes a small portion of energy to maintain. The main downside is that it cannot be used at the same time as other beam weapons. One of the most basic spells known to Nanoha, yet arguably one of her most iconic, Area Search is Nanoha's basic search-type spell. After a three second casting time, four spheres of magical energy about the size of a medium beach ball are summoned, using a portion of Nanoha's mana. Nanoha then designates a target area and target(s), and the spheres will fly away in search of the designated targets. The spheres themselves use very little mana to be sustained, but will dissipate once they have consumed all of their initial mana supply. Spheres detect targets by sight only, and are restricted by line of sight, visibility and other things that would conceal something from the naked eye. Each sphere is entirely independent once summoned, but cannot be given new instructions after being first sent out. Upon finding their target(s), the data is sent back to Raising Heart, and the sphere will consume its remaining mana to send the data package, dissipating in the process. The range at which the spheres are able to travel is about the size of a large town, though it will take some time to cover the entire area. The upgraded form of Area Search, Wide Area Search is Nanoha's wide-range search-type spell. After a four second casting time, twelve spheres of magical energy about the size of a medium beach ball are summoned, using a moderate portion of Nanoha's mana. Nanoha then designates a target area and target(s), and the spheres will fly away in search of the designated targets. The spheres themselves use very little mana to be sustained, but will dissipate once they have consumed all of their initial mana supply. Spheres detect targets by sight only, and are restricted by line of sight, visibility and other things that would conceal something from the naked eye. Each sphere is entirely independent once summoned, but cannot be given new instructions after being first sent out. Upon finding their target(s), the data is sent back to Raising Heart, and the sphere will consume its remaining mana to send the data package, dissipating in the process. The range at which the spheres are able to travel is about the size of an entire city, though it will take considerable time to cover the entire area. The spell itself can only be cast while stationary and requires manual aiming up until the beam is released. The spell requires approximately 10 seconds of charge time, has an effective range of 200 metres, a beam diameter of six feet and fires a straight beam unaffected by gravitational forces that will affect all targets within the radius of the beam. The destructive power of Divine Buster is incredible, but only direct hits will deal full damage. Direct hits result in an explosive magical effect of about five metres, that will cause destruction to nearby structures, equipment, and other creatures caught in the blast, though at significantly less strength than the beam itself. Divine Buster has a firing time of approximately three seconds, and at maximum range the beam will disperse fully after five seconds. During that time, Divine Buster is capable of breaking through shields, barriers and the like, but the destructive power of the beam will be dramatically reduced. The spell itself is moderately draining, but requires all of Nanoha and Raising Heart's concentration to cast, although existing spells that do not require their attention will persist. Link Wrote: Skyward Strike - (600, requires Ranged) - Link raises the Master Sword to the sky, and in a few seconds, a charge of energy births within the blade. Link can then slice any direction he wants to lease the bolt. The attack can be charged for up to 10 seconds to increase the power. Quote: Hero's Bow - (300, requires Ranged) - A Hylian bow and arrow set. Quote: Fire Arrows - (300, requires Ranged) - Allows Link to ignite the tip of his arrows, which explode in a small radius (whatever the max radius is without Wide Proficiency) of flame. 3 feet roughly. 300 OM. 600 (two modes). Slowing/freezing effect dependent on stats differences. You can make it dual clawshots if you like, I won't charge extra. 300 OM. Quote: Wind Waker (600, ranged) - A mystic baton that can command the direction and strength of the winds. By waving it in a particular pattern, Link can summon powerful, but short gusts or long and steady, but weak breezes. Quote: Nayru's Love (2000 (Tier 4 Super Move), wide) - Link uses the diamond shaped artifact to summon a protective barrier around his entire body which is capable of protecting Link from any attack. However, it can only absorb one attack before shattering, and the barrier cannot be sustained for long. Laughing Gas Level 1 - Grenades (300) (Ranged/Impair) - Green gas in small circular grenade like containers that cause the enemy to break into laughter. It seems harmless, but prolonged exposure will cause difficulty breathing and choking, but ultimately doesn't last long enough to be fatal. Laughing Gas Level 2- Cylinders - Green gas in a long cylinder container that cause the enemy to begin choking, as it floods their lungs with a toxin. They laugh hysterically, and the large volume of gas can cause the enemy to choke to death if exposed for long enough. Much more effective on secondaries. Yeah, I will charge differently for daggers, knives, longswords, greatswords etc. Possession: (Telepathy, Basic Fusion, Symbiosis)(Tier 1 Super Move) One of Ganondorf's most diabolical techniques, Possession allows him to inhabit the body of another person. Like Fusion, Ganondorf adds the moves, powers, stats, and proficiencies of his host to his own. However, that's where the similarities end. Firstly, while Ganondorf is within their body, he maintains the appearance of his host, albeit with a greyish tone to their skin. Secondly, this move drains 2 SP per round from Ganondorf and none from the host. Meaning that, if Ganondorf has only 2 SP when he uses this Move, he only has a single round to use it. Thirdly, all damage done to the host is transferred to Ganondorf, meaning the host cannot be harmed using the technique. Lastly, Ganondorf can only use this move on a Prime or powerful Secondary that has been defeated in combat or incapacitated in a similar way. However, when used against weaker Secondaries, Ganondorf may not need to make them unconscious first, and the drain on him is likewise lessened, though in no way completely mitigated. It can only be used against a defeated player (as mentioned) and costs 4 SP for the first post (so it's Tier 2, Utility-type). It'll cost an additional 2 SP per post after that, same as a Tier 2 Transformation. You also can't use any other Transformations of your own while you're 'possessing' the target, so it's essentially like just adding your base stats to theirs (you could also opt to do it the other way, with only using your own Transformations and not theirs, but you need to pick one or the other). (300 OM) Miasma: (Wide Proficiency, Debilitate Proficiency) In an effort to play to his strengths, Magus can tap into his power in order to manifest a thick, magical haze with several unique and dangerous properties. First, the haze is so thick it obscures the battlefield, making it almost impossible to see more than a few feet in any direction, but it doesn't appear to impede Magus in any way. Second, the haze is pervasive. It starts off as just minor aches and a slight feeling of exhaustion, as if the victim's simply gone too long without sleep. But the longer one spends in the Miasma, the worse the feeling gets, until quick movements or physical and mental exertion become significant chores. The aches begin to feel steadily worse, and the victim starts to feel horribly, horribly ill. The effect doesn't cause any actual damage, but the sluggish, weak feeling can definitely be a hindrance in combat. Again, this effect seems lost on Magus, who can stand at the epicenter of the haze and experience nothing. The haze extends in a roughly circular radius around Magus, but appears to come from nowhere as it is manifested. It can extend to a maximum of roughly 100 feet, and is dark, inky black, with tinges of purple and blue. Casting the spell itself does not involve any gestures or verbal commands and takes approximately ten seconds to complete, but the haze itself takes roughly a minute to completely coalesce. Magus must constantly channel some effort into maintaining the Miasma, and over extended periods this may prove to be draining. Significant injury or surprise may break his concentration and diffuse the magic's effects. Nanoha's automated flight spell, Axel Fin causes small iridescent wings to sprout from her boots and enables her flight capabilities as an aerial combat mage. While Raising Heart typically maintains the spell itself, Nanoha does need to initiate the spell cast itself, and it has a exceptionally minor drain on her mana. Nanoha's base flight speed is not especially fast, but her manoeuvrability in the air is noticeably better than when grounded. Using a charge of mana channelled through Axel Fin to form a localised burst of speed, Nanoha is able to swiftly react and dramatically increase her flight speed and manoeuvrability for a very brief moment. The mana drain is moderate, but repeated use will increase the drain exponentially. Raising Heart is able to load Flash Move as an Auto-Guard spell, but the agility of the move is typically lower due to the impulsive nature of auto-guard. Flash Move is specifically designed for use while flying, and is thus unable to be used on foot. Ability to dodge dependent on TEC. By funnelling her mana into Axel Fin, Nanoha is able to increase her flight speed to exceptionally fast speeds. With Mana Thrusters active, Nanoha is unable to cast additional spells (Auto-Guard spells excluded), and her aerial agility is little to none. While gradual turns or altitude changes are possible, sharp turns or evasive manurers are impractical while Mana Thrusters are active. While this does allow her to move at great speed while flying, the nature of the mana drain and concentration required makes the spell unusable in combat, and the spell is typically only used for travel purposes. Interacting with an existing Barrier defence spell (such as Protection) Barrier Burst allows Nanoha to detonate the mana used to form the Barrier spell into an explosive blast that repels or deflects a single (or multiple instantaneous) attacks. By causing a localised explosion out from the Barrier, the magical and concussive force is capable of blowing away both physical projectiles, melee attackers and magical projectiles that are in direct contact with the Barrier itself. As the majority of Nanoha's Barrier spells are used at close range to herself, she is also knocked away by the blast (but, being instigated at her own timing, Nanoha is often quick to recover). Similar in theory to a modern tank's reactive armour, Reactor Purge is a last-ditch defensive ability used by Nanoha to erupt the mana used to sustain her Barrier Jacket. Reactor Purge is capable of absorbing or deflecting a single attack against her, but will leave her incredibly vulnerable without her most important defensive measure until she is able to spend the time, mana and concentration to rebuild the Barrier Jacket. Functionally identical to Protection, this version of the spell is intended for group shielding or barrage defence. It has the same defensive strength, cast time and increased effectiveness against projectile-type attacks as Protection, but covers an area roughly 6 meters across- enough to envelop 5 closely clustered people. The spell uses a sudden influx of mana to manifest, but Nanoha is able to channel more mana into the spell to allow it to persist. This can be very draining, and the drain increases exponentially over time. While channelling, Nanoha must focus and is unable to cast other spells or move. A little long-term ground work, but I want to get it approved now so I know what's up. This is how Whirda will develop over the next couple weeks. This is in the order I'll be buying them. Whirda gradually takes on the properties of the shade because she can't find a healer in time to stave off the infection. Her skin grows gray and lifeless, eyes flecked with yellow, hair darkens to black, etc... Because of this, she gains an alternate form with the stats ATK: 0, DEF: 4, SPD: 3, TEC: 3. While in shade form, she can't access her gust and cyclonic prison (and any future non-shade moves I might buy), and her atrophied muscles greatly reduce the efficacy of physical attacks. Switching forms would take a moment of concentration. Whirda can step to any visible shadow within ten meters. Using this too many times in quick succession will sap her shadow energy and force her to revert to human form while it recharges (if this happens during a fight, I figure she's locked out of shadow form for the rest of the fight, so she has to use it sparingly). Whirda creates an identical clone of herself at target shadowy location within ten meters. The clone will try to attack a target she designates when it's created, but its attacks do minimal. Any time something strikes one of its limbs with an ATK stat of 2 or higher, the limb shreds into shadow and dissipates. Even headless, the clone can continue to attack, but any solid strike to the torso destroys it. Combined with Shadowstep, Whirda can trade places with her clone at will. Making too many clones in a short period will drain Whirda's shadow energy significantly. After a few seconds of concentration in a shadowy spot, Whirda wraps herself in concealing shadow and becomes invisible to observers. She can move in this state, but careful inspection will reveal her. The definition of overkill, Missile Storm is exactly what it sounds like. Samus's shoulder pads fold open to reveal two launchers packed to the brim with mini-missiles that, after a short delay, rocket towards a desired location. While the missiles do not have lock-on, accuracy is not necessary as the salvo has a radius large enough to catch any foe in the chain-explosions. Upgrading my Power Beam move. Addition is marked in bold. An upgrade that allows Samus to discharge her charged-up energy not just through her gun, but through physical contact, almost like a controlled static shock. Just like a charged shot from her arm cannon, it takes five seconds to charge. All it takes then is for Samus to touch an opponent with any part of her suit and the energy will be transferred, producing an explosion at the point of connection. A powerful alternate fire mode for Samus's arm cannon where three 'wings' roughly the length of the arm cannon itself extend from the barrel and fold outwards. These wings 'spin' and fire energy bullets in concert with the main cannon, allowing for a rapid-fire 'gatling' mode with a wider area of effect than Samus's usual Power Beam. While the overall damage output is higher than standard Power Beam shots, its power is less concentrated, and there is a hefty recoil which makes it difficult to aim while moving. By planting her feet and bracing her gun arm with her left arm, Samus can increase the power output even further to a destructive hail - it takes a moment to 'spin up' and 'spin down' from this mode, and is so powerful that it slowly pushes the hunter backwards when maintained. Soulfire Forzare (300): By infusing his force of will with a bit of his soul from around the area of his right hand, Harry creates a spectral hand made of the cold-burning Soulfire, the power of creation he's been able to tap into since loss of his Hellfire. The hand is approximately the size of Harry's torso, and Harry can utilize the construct to grasp an opponent and attempt to hold them in place. However, Soulfire is dangerous to utilize for extended periods, and Harry can only maintain this particular construct for about a minute at a time, though it uses so little Soulfire that he is able to activate it again within another minute of waiting. He cannot cast other spells while maintaining the Soulfire construct, and the hand itself does no damage; Soulfire is the power of creation, not destruction.